Just a reminder, today is Mega Swagbucks Day! You can win BIG points today for all your internet searches using Swagbucks.com. The values are much higher on Fridays, so rack up all those points toward great gift cards and other items for FREE! I personally LOVE the $5 Amazon gift cards. So far this year I’ve earned $170.00 worth of Amazon gift cards from Swagbucks. 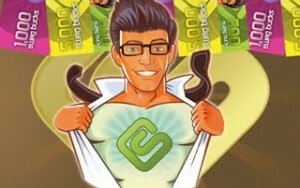 If you’re not using Swagbucks for your search engine, Start Earning Today and get 30 free Swag Bucks just for joining. Swag Bucks are digital dollars that you can spend on gift cards and other prizes.